I'm sorry it's been awhile since my last post; I've had a productive month working on several of the ongoing projects I mentioned previously, including some home renovation plans, rental property renovations, work projects, ongoing organization/Spring cleaning, upcoming vacation plans (heading to Cancún again soon and can't wait!) and so much more. Life just has a way of getting busy, right? 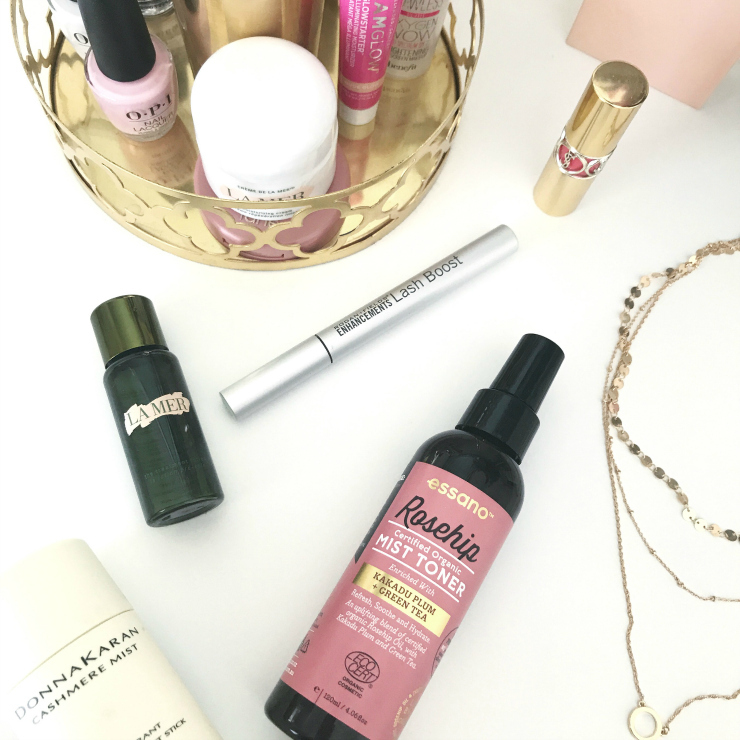 But, today I'm really excited to share a few of the goodies I've been loving lately, some new and some tried-and-true! Some of these favorites you may have already seen on my Instagram, but I'm sharing again here in one large round-up post. 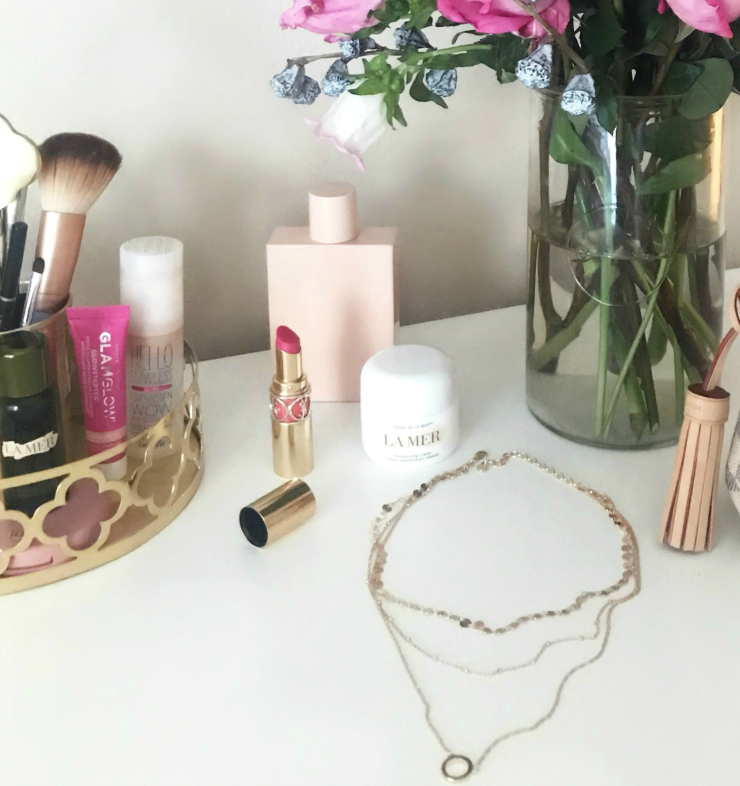 It's a bit of a fun diversion from the usual day-to-day stuff since you'll be seeing some of my less-talked-about favorites that range from makeup, skincare, jewelry, accessories and more! Surprisingly, I get a lot of questions about these despite the majority of my posts being centered around fashion. 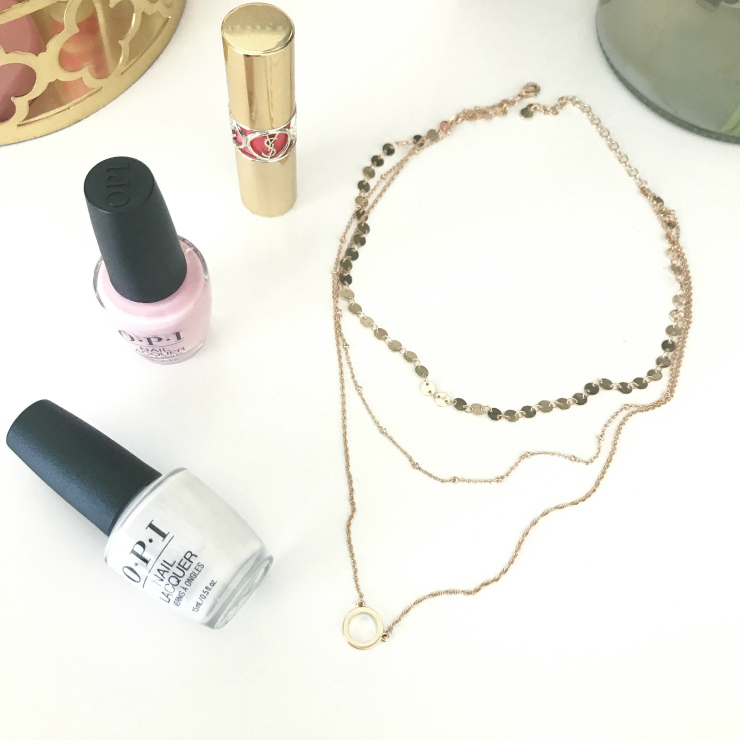 And of course I don't mind -- I'm always happy to share my finds and tips with you! 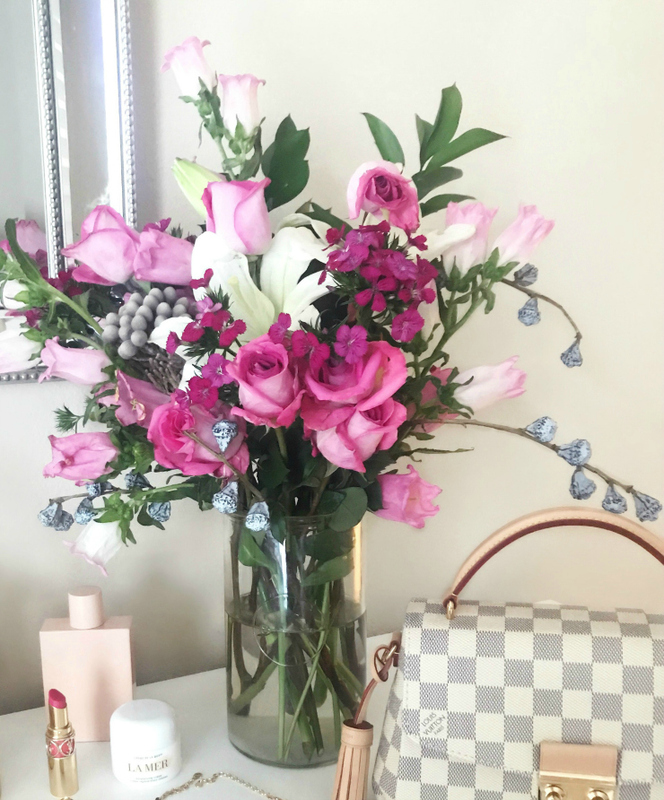 First, how gorgeous are these mixed pink and white blooms? I picked them up at the grocery store and arranged them myself. I can't stop admiring them! They add such a perfect burst of color to the room. I always joke with my husband that my other ancillary jobs are florist, photographer, and personal stylist. ;-) You'll find me in my kitchen clipping and arranging flowers every other weekend or so; it's a small thing but makes me happy. The "blue bells" and clusters in this arrangement are some of my favorites, and a fun fact: they're from BloomThat. 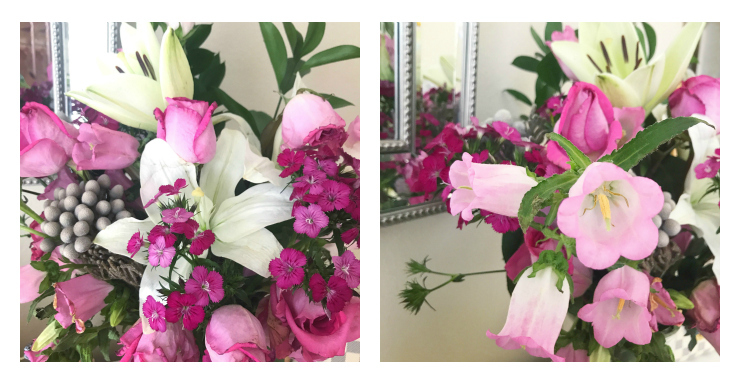 I've featured their blooms a few times on my Instagram, and just adore their floral designs. Their staff is incredible, too -- always super kind and helpful. Since these blue beauties are a dried variety from previous arrangements they've sent me, I carefully removed and stored them for later use. I then just mix them in with fresh blooms whenever I want. Just a small tip for those of you who like to get creative, like me! Ok, on to the goodies! This YSL lipstick shown above is a longtime favorite of mine and definitely deserves a mention. My go-to color is "Pink Devotion 06," which is a flattering berry color that's not nearly as fuchsia as depicted in the online stock photo. The formula is a nice, glossy finish, and the color builds so you can layer as much or as little as you want. It wears off as a subtle lip stain so that you still have a hint of color even after hours of wear, too. Plus, the ornate, gold tube itself is a work of art and looks gorgeous displayed on any vanity! 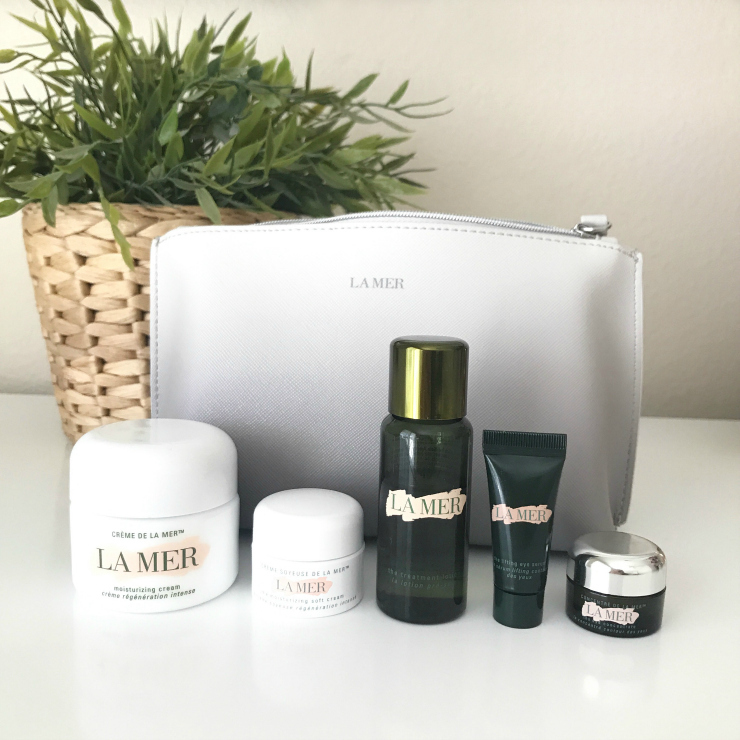 To extend the life of my La Mer products, in addition to using them sparingly, I use a couple of other skincare products interchangeably. I stumbled on the Essano line at T.J.Maxx after a search for organic, all-natural face products, and it has been such a pleasant surprise! Its products are made in New Zealand, all products are certified organic and animal-cruelty-free, and have no parabens, sulphates, silicones, phthalates, ethoxylates, mineral oils, or GMOs. My favorites have been this rosehip toner (pictured above) and this collagen-repair serum. I love that they're gentle and contain ingredients like rosehip oil, green tea, kakadu plum (high in Vitamin C) and aloe vera to help soothe and hydrate the skin. The toner smells so amazing, too, thanks to the rosehip oil! If you can find these products at your local T.J. Maxx store, they're both super affordable at only $6 each! If you've been on the hunt for organic, all-natural skincare products, definitely give this skincare line a try! I want to give a quick mention to my current favorite deodorant, which is also pictured above. It's one of the best ones I've used and lives up to all the hype. Before you scoff at the price (I know I did) and write it off completely as a sham, sift through and read some of the 500+ online reviews and you'll see how many people love it as much as I now do! 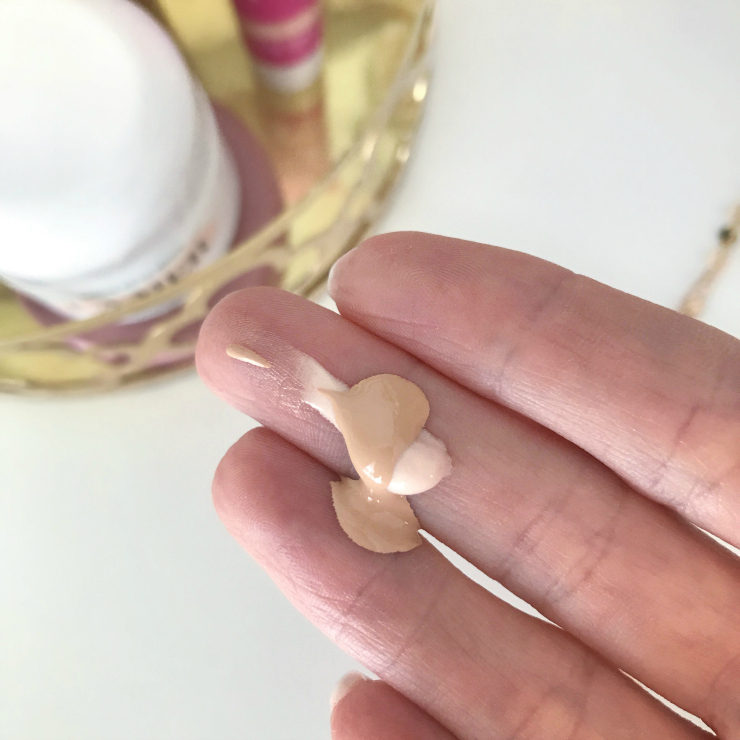 It glides on smoothly, smells lovely, and really lasts! If it can endure an intense exercise workout (hello, BBG) then it's a keeper in my book. 1.) Yes, it's all my natural hair; no extensions. 2.) I do color it. I get cool, blonde highlights every 6 - 7 weeks. The lowlights are my natural hair color, a medium brown. 3.) I've kept it long most of my life. The shortest length was just below my shoulders when I was in junior high school. When I get it trimmed, I usually ask for 2 - 3 inches to be taken off to remove dry, split-ends. I also get longer layers around my face to help frame it and to add volume. 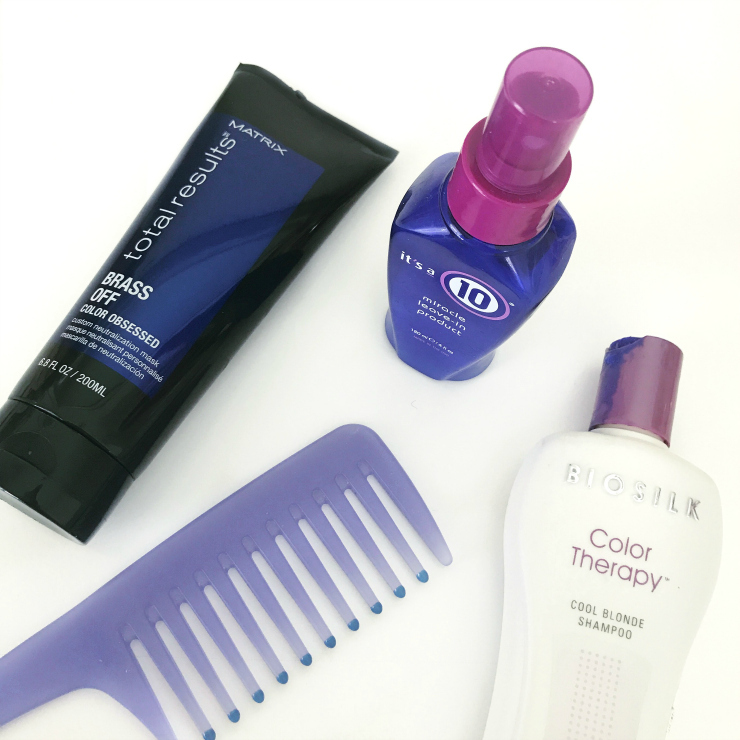 I use the above hair products consistently, plus varied color-preserve conditioners. I'm not really loyal to a particular brand or formula of conditioner since I find my hair gets weighed down after using the same conditioner over time, leaving my hair limp. I usually change my conditioner every month or more frequently as needed. I also try not to over-wash my hair to prevent drying and breakage. I can go about 2 days between washes, 3 tops, without feeling completely disgusting. (lol) I'm also not a fan of dry shampoos. I swear by the Brass Off Mask above. It really helps to tone hair color and remove any brassiness between visits to the salon. Be warned: it's a rich, saturated blue color and can stain your white shower walls and tile grout if you aren't quick to wash it off! I've never had any problems washing it off the shower walls/floor while showering, but I just want to mention it in case you're alarmed when first trying it. I've also used the same, basic Conair curling iron and blow dryer for years! 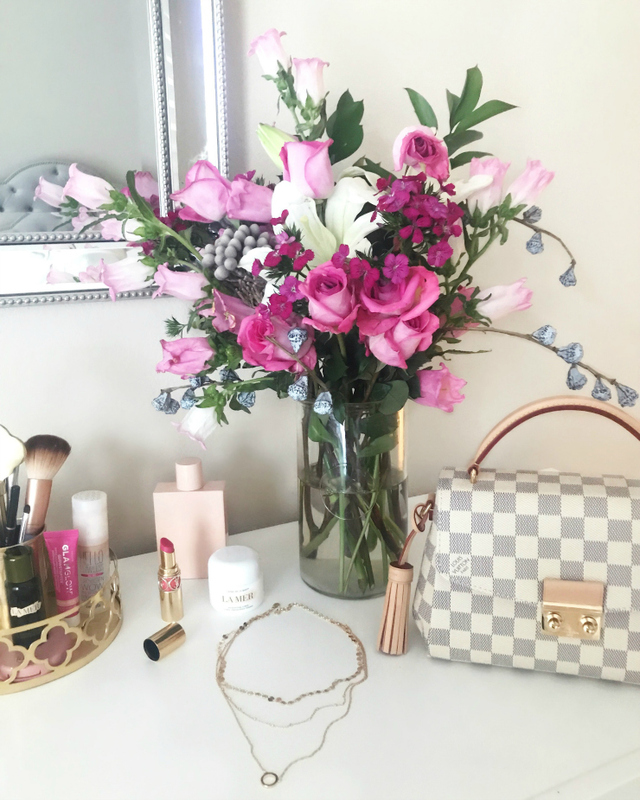 I tried the popular T3 blow dryer that I've seen other bloggers rave about, and immediately returned it; the air flow wasn't nearly as powerful as my old trusty one, and it took me much longer to dry my hair! That was the deal-breaker for me. I also prefer using a standard curling iron with a clamp instead of a wand, and usually stick to a 1.25" barrel size for pretty, bouncy curls that look soft and natural. I just take small pieces of my hair and curl away from each side of my face, and repeat until done. Then I loosely break up the curls with my finger tips and spray with hairspray to set. It's easy-peasy and usually doesn't take me more than about 5 minutes, which is perfect for this busy momma-on-the-go! And there you have several of my current favorites and a few tips! I hope you found them helpful! Let me know if you've tried any of these and what you think. Or, if you have any favorites that you swear by and that are must-trys, I'd love to hear them -- comment below! Thanks so much for stopping by, and I hope you have a great rest of the weekend! Thanks for this post- so informative! I’ll have to try the Essano brand and I’ve never used the It’s a 10 leave in. I’m going to try those for sure. I’ve used Paul Mitchell’s Skinny serum for my frizzy hair for years! You are very welcome and I'm so happy you found this post helpful! Yes, the Essano brand was such a nice surprise to find and you can't beat that it's all-natural, organic, and affordable! Let me know how you like it once you give it a try. I hope you love it as much as I do. The toner smells so good! I appreciate you reading and commenting!